Using the Query Editor is the easiest way to run queries on databases hosted by your Amazon Redshift cluster. 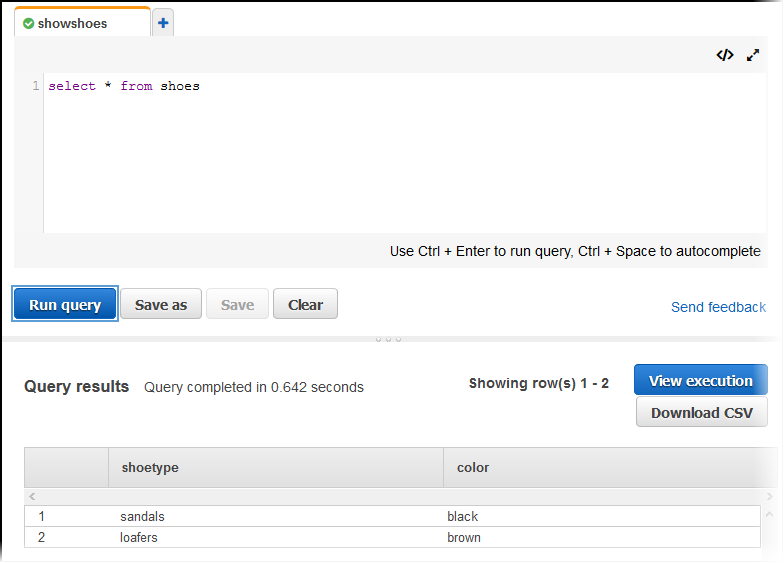 After creating your cluster, you can immediately run queries by using the Query Editor on the Amazon Redshift console. Run single SQL statement queries. Download result sets as large as 100 MB to a comma-separated value (CSV) file. Save queries for reuse. You can't save queries in the EU (Paris) Region or the Asia Pacific (Osaka-Local) Region. View query execution details for user-defined tables. Up to 50 users can connect to a cluster with the Query Editor at the same time. The maximum number of users connecting to a cluster includes those connecting through the Query Editor. Up to 50 workload management (WLM) query slots can be active at the same time. For more information about query slots, see Implementing Workload Management. Query Editor only runs short queries that can complete within two minutes. Query result sets are paginated with 100 rows per page. You can't use the Query Editor with Enhanced VPC Routing. For more information, see Amazon Redshift Enhanced VPC Routing. You can't use transactions in the Query Editor. For more information about transactions, see BEGIN in the Amazon Redshift Database Developer Guide. To access the Query Editor, you need permission. To enable access, attach the AmazonRedshiftQueryEditor and AmazonRedshiftReadOnlyAccess policies for AWS Identity and Access Management (IAM) to the IAM user that you use to access your cluster. If you have already created an IAM user to access Amazon Redshift, you can attach the AmazonRedshiftQueryEditor and AmazonRedshiftReadOnlyAccess policies to that user. If you haven't created an IAM user yet, create one and attach the policies to the IAM user. Create a custom policy that allows calling redshift:GetClusterCredentials and restricts the resource to a DbUser. For more information, see Create an IAM Role or User With Permissions to Call GetClusterCredentials. Choose the user that needs access to the Query Editor. For Policy names, choose AmazonRedshiftQueryEditor and AmazonRedshiftReadOnlyAccess. Download a query result set. To complete the following example, you need an existing Amazon Redshift cluster. If you don't have a cluster, create one by following the procedure described in Creating a Cluster. Sign in to the AWS Management Console and open the Amazon Redshift console at https://console.aws.amazon.com/redshift/. In the navigation pane, choose Query Editor. For Schema, choose public to create a new table based on that schema. Enter the following in the Query Editor window and choose Run query to create a new table. Enter the following command in the Query Editor window and choose Run query to add rows to the table. Enter the following command in the Query Editor window and choose Run query to query the new table. You should see the following results. Choose View execution to view the execution details. Choose Download CSV to download the query results as a CSV file.